Guitars for Vets (G4V) is a nonprofit organization founded by a Combat Marine and his guitar instructor in 2007. Today G4V has gifted more than 3,000 guitars and 35,000 lessons to Vets recovering from the effects of war. 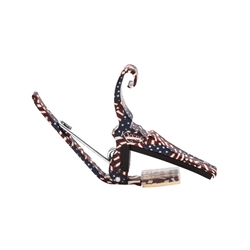 The G4V Kyser Quick-Change Capo is an essential accessory that every Veteran receives upon graduation. 100% of profits from the sale of this Quick-Change capo will be donated by Kyser to the G4V mission. Your purchase will help put the healing power of music in the hands of heroes! There is no substitute for a genuine Kyser Quick-Change capo. Made by hand in Texas, USA. Guaranteed for life. White body with G4V logo. American flag handle.